With the cost of college and the average amount of student loans skyrocketing, national financial education nonprofit American Consumer Credit Counseling is celebrating 529 College Savings Day on May 29th by sharing useful tips that will help students make money-savvy decisions and save for school. Personal finance can be a tough subject for college kids and parents, but it is one that needs more attention. Today young adults are graduating college with more student loan debt than ever. According to a report released by the Federal Reserve Bank of New York in February, student loan debt has climbed to $ 1.16 trillion. The average American college student is now graduating with $ 33,000 in debt, and 52 percent of parents feel it is more important to save for their kids’ college education than their own retirement, according to a recent T. Rowe Price survey. A 529 plan is one option for families to save for college. A 529 plan is an investment plan operated by a state or educational institution, with tax advantages and other incentives to make it easier to save for college for a designated beneficiary, such as a child or grandchild. Operating similar to IRA and 401(k) plans, 529 college savings plans allow parents to save for a child’s education tax-free through an array of investment options. 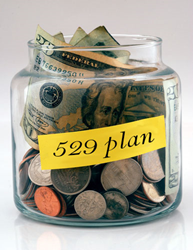 There are two types of 529 plans: prepaid tuition plans and savings plans. The plans are named after Section 529 of the Internal Revenue Code and are administered by state agencies and organizations. 1. Learn to Budget Now – Developing a realistic and manageable budget is a valuable lifelong skill that is essential for anyone in college, preparing to go to college, or just graduating. Start by using a budgeting worksheet for students to get an accurate picture of your income and expenses. By comparing and contrasting your total income and expenses, you will be able to create a feasible budget plan. By sticking to your budget, you will avoid going into any unnecessary credit card debt. 2. Beware of Credit Card Debt- Credit card companies target college students because they have little experience managing their money. If you sign up for a credit card, don’t get carried away. Get your payment in by the due date or you’ll be slapped with late fees and create additional debt for yourself. 3. Work – Consider a part-time job, tutoring, paid internships, and work-study programs to earn and save money while in school. If you’re looking to get an apartment after graduation, make your student loan payments, or relocate for a job, saving for your future will help you in the long run. 4. Use your Student ID for Discounts – Not only will you need it to enter your dorm, the dining hall, and the library, but your student ID can also earn you discounts at hundreds of retailers nationwide. If you are not sure if a company offers a student discount, just ask. Check out the College Financial Workbook for a full list of discounts. 5. Be Aware of Your Financial Situation – Too many students graduate from college without any idea of how much they’ll have in student loans, or how much to expect to make at their first job. Make sure you know how much school costs per year, what your parents are covering, what you’ll be expected to cover, and budget for rent and living expenses accordingly.